Kensington Palace has had millions cooing by releasing photographs of Prince George holding his sister Princess Charlotte. But what's the story behind George's clothes, ask Justin Parkinson and Paul Kerley. 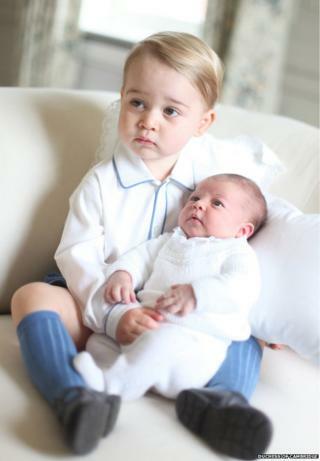 Taken by their mother the Duchess of Cambridge, the latest photos of Charlotte and George show the latter, now 22 months old, in knee-length light-blue socks, smart black shoes and a white and blue shirt. It's on the traditional side. It's not the first time such an ensemble has featured in royal pictures. George himself wore the same outfit, plus a cardigan, to visit his baby sister in hospital for the first time, in May. The cardigan reportedly sold out afterwards. The outfit had echoes of that worn by a five-year-old Prince Charles - including long socks and shorts - in a photograph taken with three-year-old sister Anne. The focus on continuity of dress is important to the "royal brand", says public relations expert Mark Borkowski. "There's something rather beautiful in the fact that the pictures could have been taken in the 1920s, 1930s, in fact any decade up until the present day," he says. "It's greatly reassuring. The duke and duchess are not trying to make a fashion statement, but to dress George timelessly. Could you imagine the outrage if they tried to make sure their children kept up with those of Kanye West and Kim Kardashian?" George's outfit, featuring designs by London-based Rachel Riley, has a longer lineage, according to fashion historian Amber Butchart, author of Nautical Chic. She sees a hint of the maritime in it, part of a tradition stretching back at least to the time of Queen Victoria. Prince Albert, the future Edward VII, was captured in a sailor suit by the painter Franz Xaver Winterhalter in the 1840s. This influenced wider fashion. "By the 1860s the practice of dressing children in sailor suits was spreading rapidly," says Butchart, "and since around this time the sailor suit has been used in both children's clothing and women's fashion. In the 1980s, quintessentially British design house Laura Ashley recreated the sailor dress as a marker of middle-class respectability, a look that Princess Diana made her own." William himself wore a sailor suit on the balcony of Buckingham Palace as a small boy. The future Edward VIII and George VI did the same. The Duke of Cambridge has been keen to use names from both sides of his family - Charlotte's middle names are Elizabeth and Diana. The choice of George's outfit continues this theme, says Butchart.